While we’ve been planning and doing everything else involved in starting a brewery we have managed to make a few beers. We’ve obtained two 15 gallon whiskey barrels. The first, a Rye Whiskey Barrel from FEW Spirts was used to age an Imperial Red Ale. The Red aged for about 3 months before it was kegged and a Milk Stout was added for the second turn. 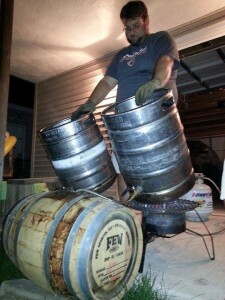 The second barrel, a Bourbon Barrel from Journeyman Distillery, is currently holding a Russian Imperial Stout. The plan is to use these beers for some promotional events at the brewery once we get a little closer to opening. Stay tuned.